Personal information security is very important for all Internet users. 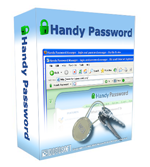 Handy Password manager is password protection software that uses several different methods to protect your data. Master password is needed for password security. When you first launch the application you are asked to create a master password that grants access to your personal information that is stored in Handy Password database (your passwords, logins and other information). You will have to enter your master password each time you launch the application. Master password protests your data from unauthorized access attempts and thus guarantees your personal information security. While using our password manager you can activate the auto-lock function for Handy Password to lock up automatically over a period of time to guarantee your password security. You can specify the time period of the auto-lock. The auto-lock function is necessary when you leave the browser open and want to make sure nobody gets access to your personal data. Your personal data stored in Handy Password manager are encrypted with 128-bit encryption algorithm. It is a strong encryption method which insures high password security. Even if someone gets access to your personal data it will take them years to decipher the data. Because Handy Password manager allows filling in passwords automatically, you don't have to type passwords. Thus no keylogger will be able to detect your passwords. Handy Password manager provides password security and secure password storage. Besides, no one will see you type your password, not even the people in the same room as you are because with Handy Password you don't really have to type it. You can back up your personal data stored in Handy Password to avoid data loss in case of hardware failure. You can back them up manually or use our proprietary backup software Handy Backup that allows backing up data automatically to virtually any known storage device or online. Your personal information security is important for us, so do not hesitate to make use of our password security software - Handy Password! With Handy Password all of your personal data are securely saved, stored and managed. No data loss or data theft can occur if you use Handy Password!